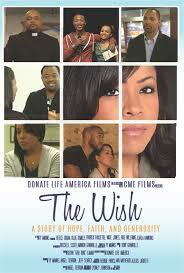 The inspiring story of “The Wish” revolves around a beloved African-American high school teacher’s struggles with kidney disease and kidney failure as she awaits the kidney transplant she needs to save her life. At each showing, we will engage the audience with a 15-30 minute introduction of the organ, tissue and eye donation message with a personal reflection from a transplant recipient, donor family member, living donor and/or someone on the transplant waiting list to help set the stage. The movie will then be shown. Following the movie, an additional 30-45 minutes will be made available to review common myths and misconceptions, to explain the Michigan Organ Donor Registry and how to sign up and to answer questions from the audience. Each viewing will provide an opportunity for audience members to sign up on the Michigan Organ Donor Registry as well as to take material home that they can pass along to help educate others. If you are interested in more information about scheduling a showing of “The Wish”, please contact Cathy Warren at cathywarren589@gmail.com.